Heal Your Puzzle » Blog Archive » Feeling stuck? Trying hard to change things but without success? Feeling stuck? Trying hard to change things but without success? Cripes! It’s June already!! And it’s still feeling like winter… not for long I hope 🙂 But do you ever feel like life is a bit stuck? Same old, same old… same issues reappearing, same conversations, same feeling of discontent however hard you try to change things? 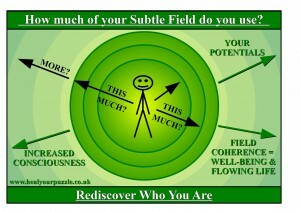 When I started on my holistic training, I think this feeling was one of biggest reasons behind my search for answers. I thought and felt that there must be a more fulfilling way to live life; there must be a way to overcome the past hurts and disappointments which I felt did not really apply to me anymore. They however just seemed to hang around me, repeating themselves in different places and with different people… why? Working with energy psychology has given me my answers and has opened up the magic of life for me… not always a pleasant experience when you face yourself and all your hidden demons but I have come through to the other side every time and realised that I had good reason to behave and feel the way I had in the past. I had no reason to self-doubt, no reason to blame myself, no reason to blame others; just transform the past into something constructive for Now and the Future. The energy behind Life and Nature is monumentally amazing! And monumentally chaotic and destructive at times. Challenges and ill health can feel insurmountable but when working with energy there is always a path through the storm. My picture here, I refer to all the time in my work 🙂 You in the middle, living your life within your comfort zone. Then Life Happens! (not always by choice) and you have to step beyond the familiar. We all do this in our own way, sometimes with support, sometimes not, sometimes it is too much and we retreat. This is our choice.